Over the past two months, what began as a peaceful protest in the heart of the capital of Ukraine, Kiev, turned into country-wide unrest. The first outpouring of protests followed brutal beating of peaceful demonstrators, mostly university students, by the riot police, on November 30th. Furthermore, on January 16th, Ukrainian government voted on a package of harsh anti-protest laws which, among others, included criminalizing defamation, wearing a helmet or covering one’s face, pitching tents, blocking access to public buildings, and driving in a convoy of more than 5 vehicles. A large number of these laws were clearly aimed at curbing the protests that originated on Maidan Nezalezhnosti (Independence Square, the main street of Kiev). This move was perceived by many Ukrainians as an attempt to further transform their country into a dictatorship, which resulted in multiple violent clashes between riot police and demonstrators across the country. Many believe the protests are a result of the President’s refusal to sign a European Union agreement, but the issue is much more complex than that. 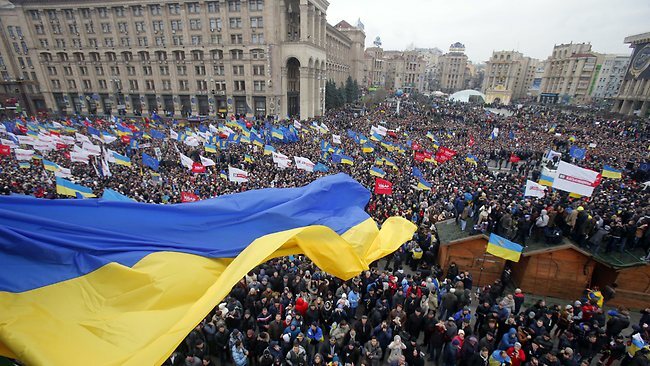 Ukrainians are protesting government corruption, police impunity, and many major violations of human rights such as violation of freedoms of speech, association, assembly, media, privacy, and civil society. I am not a fascist, terrorist or criminal. I am proud of my language and culture. This is not just about joining the European Union anymore. This is about our right to live in a democratic State. Call your Congressman, Member of Parliament, Senator, Queen, President, King. Say that you support sanctions on the Ukrainian politicians…those who stand against democracy. Share your stories with your friends and co-workers. Ask your news provider to cover the events here. On behalf of Ukrainians, we urge you to contact your country’s representative. Below you’ll find a sample letter for the US, and welcome you to share resources for contacting leaders around the globe. What is really happening in Ukraine? PLEASE contact your House of Reprentatives Member and tell them to SUPPORT CONGRESSIONAL RESOLUTION H.RES.447. Sample letter below. Attached, please find a sample letter to Members of Congress. Letters may be e-mailed directly by using the House website at:http://www.house.gov/representatives/. Please find your elected official and simply fill in the form and text in the “Comments” section. Should you have any questions, please contact the UNIS office at (202) 547-0018 or at unis@ucca.org.